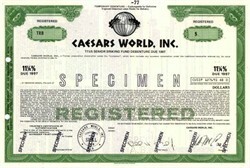 Beautifully engraved RARE SPECIMEN certificate from the Caesars World, Inc. printed in 1979. This historic document was printed by the American Banknote Company and has an ornate border around it with a vignette of an allegorical woman next to a globe. This item has the printed signatures of the Company’s President and Secretary. Caesars World was a casino operator. It began as Lum's Inc., owner of the Lum's chain of restaurants. It shifted into the gaming business with the purchase of Caesars Palace on the Las Vegas Strip in 1969, selling off the restaurants and changing its name. Caesars grew to eight casinos and resorts over the years, until going through a series of ownership changes beginning in 1995, and was ultimately absorbed by Park Place Entertainment in 1999.